I often think one of the unspoken blessings from working in the community sector is that I always got to work with older women. Work places that are all one age are less interesting to me, and there is so much benefit spending time with folks who have been through trials and tribulations of life and still turn up to work the dignity, safety and rights of folks experiencing disadvantage. An Aunty network is quite a thing to have, and I wish more people had it, there have been some pretty rad Uncles along the way too. Some of the Aunties and Uncles of social justice, have so much kindness in them. So much strength and patience and kindness. Some chuckles and wicked wildness in there too. Some are storytellers who know they’re creating space for what comes next. I’ve been thinking about interviews with astronauts and how they practice practice practice, go through all the scenarios in a clear minded way, so all the things that could kill them (and there are so many) just become things they have prepared for. 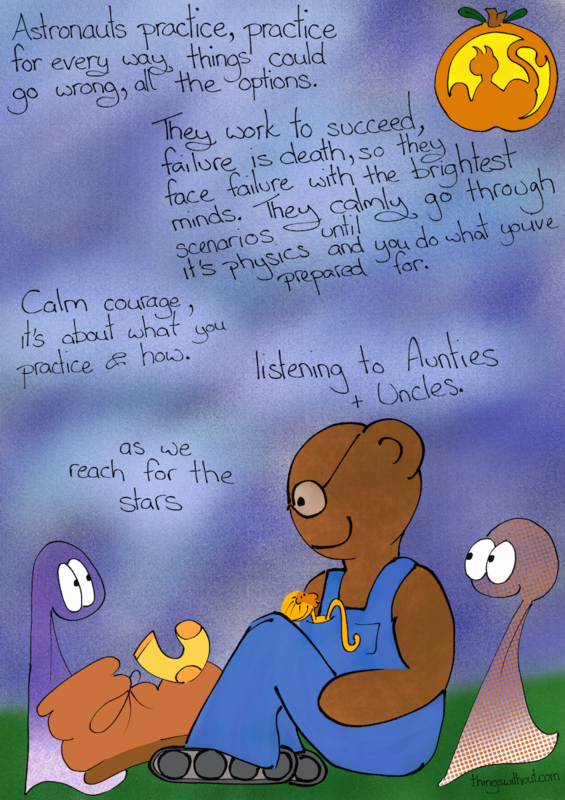 Aunties and Uncles can be like the scientist teams, helping us prepare, helping us see the scenarios, bringing information from past experiments (and having seen disaster and failure), staying grounded as we reach for the stars.